The OPEN MIC S.L.A.M. Jar is a staple at our Open Mic Nights. We couldn’t do our OPEN MIC nights without the musicians who come out to support and play, and we want to make sure we show our appreciation. In our efforts to get people to support local musicians and artists, the S.L.A.M Jar is where we collect tips that get split up by all the musicians who perform at our Open Mic’s. Its not always a lot of money, but it does go a long way in showing the musicians how much we appreciate them! And it gives them more incentive to come out and stay through the night. 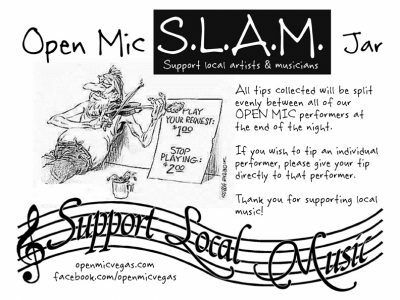 Open Mic Vegas is dedicated to promoting and enhancing the live music scene in Las Vegas, and the S.L.A.M. Jar is just one of the ways we try to help.